Janhvi Kapoor is one of the few Bollywood star kids, who remains faithful to her fitness regimes. The actress, who made her debut with the film Dhadak, was snapped outside the gym in Mumbai on January 14, 2019. 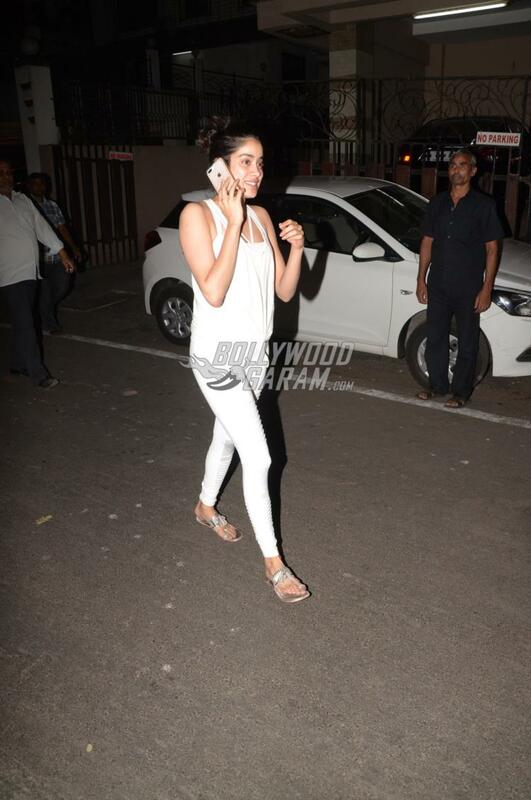 Janhvi looked chic in an all white casual outfit as she made her way towards her car. The Dhadak actress was seen in a white tank top with a pink bralet with white tights and teamed it up with silver footwear and her hair tied in a bun. Janhvi was snapped talking on her phone as she stepped out of the gym. The actress was all smiles and waves as she was clicked by the paparazzi. Janhvi made a successful debut with the film Dhadak which also starred Ishaan Khatter and will be seen next in the Karan Johar production Takht. The film also stars Kareena Kapoor, Anil Kapoor, Ranveer Singh, Bhumi Pednekar and Vicky Kaushal. Janhvi was appreciated for her debut performance in the film Dhadak that was directed by Shashank Khaitan.